The PackMan system consists of 4 components that can be used in combination to support any number of users across any number of sites. Configure the sytem that's most cost-effective for your current needs. PackMan is flexible enough to expand as your demands grow. 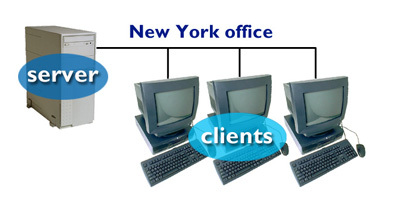 A typical single-office installation consists of the LAN Server plus workstations connected to it over a local area network (LAN). Each workstation runs the LAN Client software. A client license is also included with the LAN Server, which can double as a workstation. When your business spans multiple sites, one site runs a special version of the server software that acts as a clearinghouse for data updates from all users. 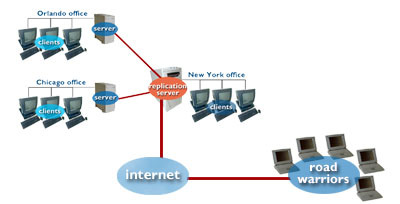 Server machines at the other sites exchange data with the Replication Server on a regularly scheduled basis so that the data in each office is closely matched. Each site contains a full set of data for total redundancy. The Road Warrior software runs on any Windows-based notebook computer and offers access to all the data and every feature that's available to users in the home office. View and modify data while on the road or in a plane, disconnected from the network. 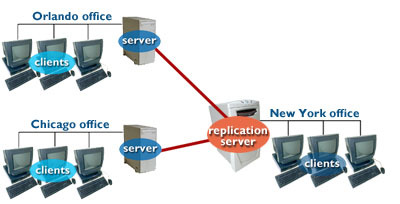 Later, two-way synchronization to the Replication Server via the Internet or dial-up ensures that everybody sees the same data.